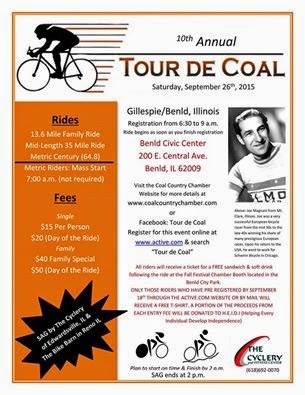 Join the Coal Country Chamber of Commerce on its tenth annual Tour de Coal bicycle ride on Saturday, Sept. 26, 2015, at the Benld City Hall-Civic Center, 201 E. Central Ave. in downtown Benld, Ill. (62009). The Tour de Coal is for riders of all ages and abilities who have an interest in cycling in the Macoupin County, Ill., area and will allow cyclists to ride in memory of Joe Magnani, who grew up in Mt. Clare right here in Coal Country. Magnani became one of the premier cyclists on the European scene in the 1930 and ‘40s. 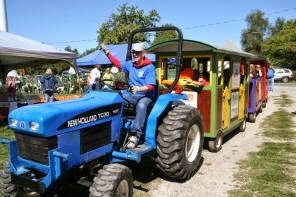 The ride will be held in conjunction with the 16th Annual Fall Festival held at the Benld City Park, where the bike ride ends. Jim Marcacci, a member of the Tour de Coal Committee which is sponsored by the Coal Country Chamber of Commerce, is proud to bring Joe Magnani his due in his home town area during this year of the 10th anniversary of the Tour de Coal Bike Ride. In the 1930s and ‘40s, Magnani’s heroics were largely ignored in the U.S. because there were few followers of the sport here. Magnani raced professionally for several French and Italian teams from 1935 to 1948.
in northern France where he nearly starved to death. Magnani was released after the liberation of Paris in 1944 and returned to cycling. In 1948 he came back to Chicago, was in a crash which forced him into retirement, and began a longtime affiliation with Schwinn Bicycle Co.
Marcacci reports that Magnani assembled the coveted Paramount track and road racing bicycles and did part time coaching. Even though Magnani was a fixture of Europe’s road races, he never had the opportunity to be in the Tour de France because at that time the teams were organized into national teams and were not sponsored as they are today. At one time, Magnani was close to competing on an international composite team, but another rider bought his place onto the team. Magnani was born in LaSalle, IL, but moved to Mount Clare as a child. His father worked in the coal mines, but as work dried up and the Depression loomed, Magnani, then a teenager, and a sister were sent to live with relatives near the French-Italian border, not an uncommon practice with bigger families, said Marcacci. Magnani visited the Coal Country area into the 1970’s. He died in 1975 at age 63 of Parkinson’s disease. Magnani still has relatives in Mt. Clare and Staunton. Marcacci and the other members of the Tour de Coal Committee believe that this 10th year of the Tour de Coal is a good time to revive the memories of the Joseph Magnani, who won races all over Europe decades before other known breakout American cyclists, such as Davis Phinney and Greg LeMond. Registration is from 6:30 a.m. to 9 a.m. at the Benld City Hall-Civic Center on the day of the event. You can save money by registering in advance either by mail or through Active.com. Advance registration is $15 per person and $40 for a family of three or more people living in the same household. On the day of the ride, the cost is $20 per person and $50 for family of three or more people living in the same household. 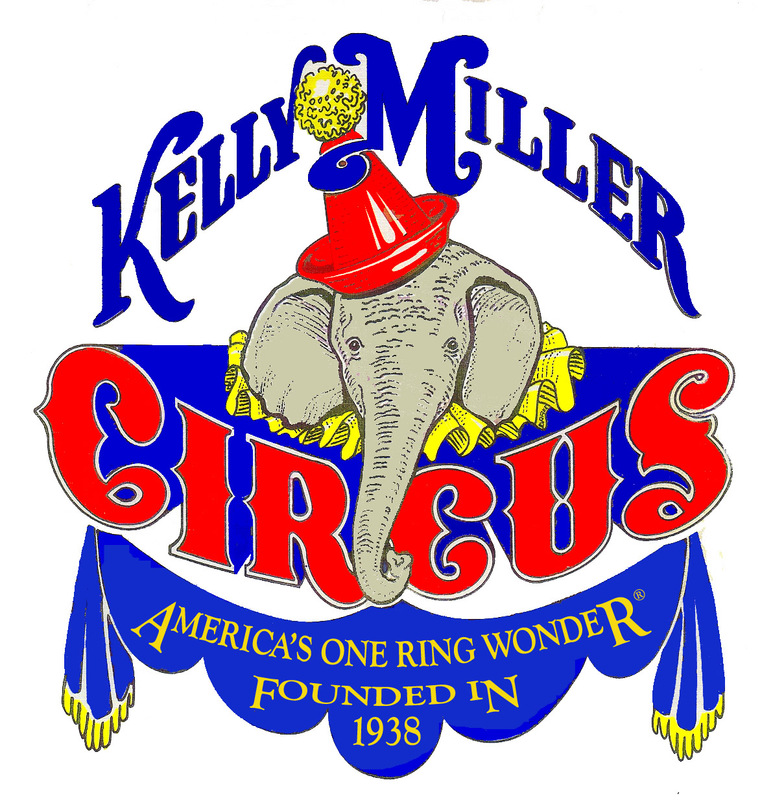 Preregistration opportunities will be up and running after April 15, 2015.